Somewhere in England, the Quiet Beatle’s farm champions Ahimsa dairy. Marianne Landzettel: Travel north outside of London and you will have reached Bhaktivedanta Manor, the sprawling 17-acre Hertfordshire countryside estate that George Harrison purchased in 1973 for the followers of Lord Krishna. Home to the UK chapter of the International Society for Krishna Consciousness (ISKCON), the campus bustles with the collective hustle of both devotees and visitors to the Radha Krishna temple, occupying much of the ground floor of the Tudor-style building. 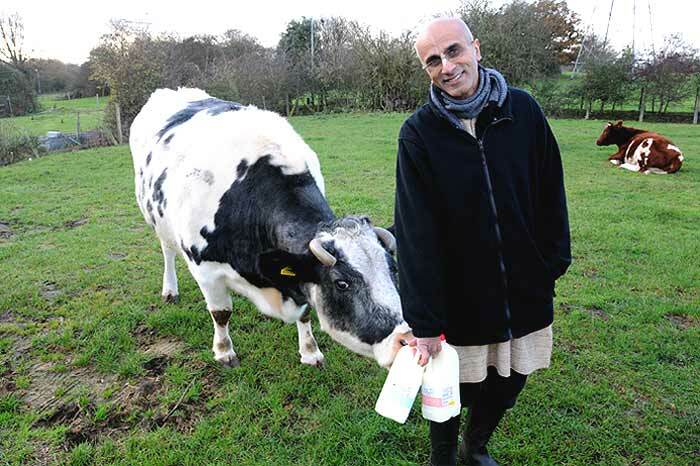 But while the Bhaktivedanta Manor is famous for its colourful history, not as well-known is its reputation as a model for organic dairy—for its Ahimsa milk standard and the humane treatment of its cow herd. I visit the Bhaktivedanta Manor a day after the 10th anniversary of Harrison’s death was commemorated on November 29. Garlands of marigold are still strewn about in the memorial garden. I saunter to the large barns that house the community’s 55-strong dairy herd. On this beautiful late November morning, most of the cows are out grazing; two calves and a group of males are knee-deep in freshly deposited straw cushions. “We have set up the Ahimsa milk standard,” says Ahimsa Dairy Foundation director Sanjay Tanna (or Sitarama Das, as he is known amongst the Krishna devotees), referring not only to the farm’s fully organic products, but also its ‘no-slaughter policy’. Bull calves here are not sold to be killed at abattoirs, but stay and work for a living. This particular morning, four are engaged in pulling the ploughs on what is to become a potato field. On weekends and during festivals, there are bullock cart rides, very popular amongst children. That is the goal set by the Go Dharmic Campaign, which has opened stalls at 25 major Hindu festivals. Says Richard Green from the Organic Milk Suppliers Cooperative, “There was a lot of interest. They have more than 8,000 followers on Facebook by now.” The campaign couldn’t have come at a more propitious moment—the big players in the industry don’t just decry organic dairy as being backward, but are pushing for US style mega dairies in the UK. Several applications to this effect are pending. To get an idea of how mega dairies tick, both advocates and critics have been travelling to Oak Farms in the US state of Indiana. Here, 32,000 cows, most of them black and white Holsteins, live in huge barns, each with a capacity to hold 3,000 heads. 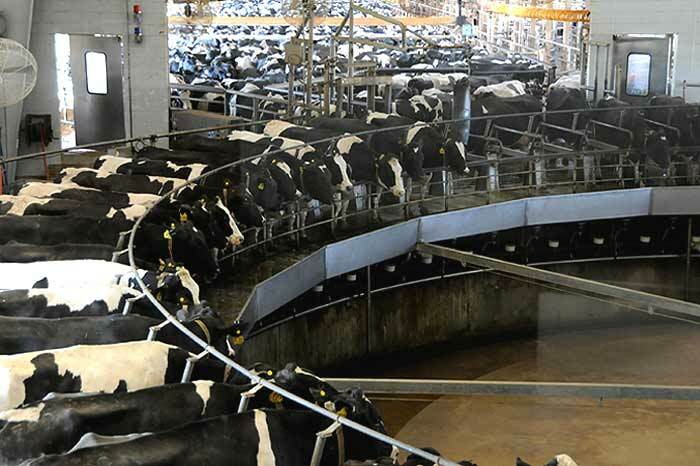 In batches of 350, they queue up to be milked thrice a day, their hind legs pressed apart by their enormous udders. On average, each cow gives around 37 litres of milk daily. The 10 milking carousels are run round the clock: 75 cows are milked simultaneously in 8.5 minutes—and that’s just with one turn of the carousel. During their brief lives, the cows of Oak Farms don’t get to see a blade of grass nor feel a bed of straw under their bellies. They are kept indoors throughout the year, their feed consisting of a complex mix of corn silage, soya beans and additives like minerals. They lie on sand, which, the farm managers say, makes it easier to keep them clean. The calves—on average a 100 are born daily—are separated from their mothers within hours. The bull calves are sold immediately, to be fattened and slaughtered. The females will be artificially inseminated as soon as they reach puberty and they will join the queue at the milk carousel as soon as they give birth. On average, cows in mega dairies have two calves in quick succession, which exhausts their bodies. By four, they are deemed ready for the abattoir. By contrast, it is not unusual for cows in an organic milk herd to be still productive even when they are well over 10 years old. At Bhaktivedanta Manor, a cow stops working at age 16 (if not earlier), which is about equal to 60 human years. In retirement, they are left to graze and enjoy themselves until they die a natural death, their passing mourned with flowers and even a little ceremony. George would have approved.